I love getting my nails done, and I look forward to it every week. I even pin nail designs I like on Pintrest – how geeky is that? Well, the geek doesn’t stop there. 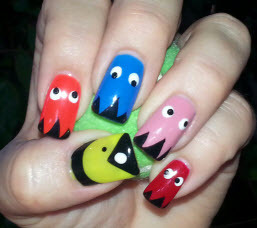 I ran across someone who did her nails à la Pac Man. After weighing the pros and cons of sporting such a colorful design, I decided what the heck, ya only live once, right? I think my nails (and toes, too) came out awesome. I’m having such fun with them. The cashier at a Starbucks drive-through oooh’d and ahh’d over my nails this morning. What fun we had!